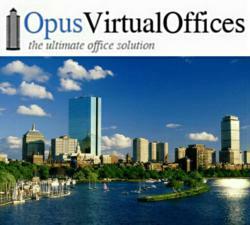 Businesses from multi-office corporations to single home based companies can say "Cheers" to Opus Virtual Office's introduction of its new location in Boston, MA. Located in the historic Beacon Hill neighborhood, Opus VO reinforces its presence as a leading provider of virtual offices in the Northeast and nationally. Opus is proud to offer its clients a new corporate address in Boston. Our virtual office solution features everything businesses need to succeed for only $99 a month, including a powerful market presence." - Yori Galel, CEO, Opus Virtual Offices. Businesses from multi-office corporations to single home based entrepreneurs have a reason to say "Cheers" as Opus Virtual Offices announces the grand opening of its new location in Boston, MA. With the introduction of its first Boston location, in the historic neighborhood of Beacon Hill, Opus VO strengthens its presence as a leading provider of virtual office services in the Northeast market and nationwide. "Opus is proud to offer its clients the exciting opportunity to acquire a corporate address in one of Boston's most desirable neighborhoods. Our virtual office solution features everything businesses need to operate beautifully and succeed for only $99 a month, including a powerful market presence in the Northeast," says Yori Galel, CEO, Opus Virtual Offices. More businesspeople than ever are aware of virtual office benefits. Yet others don't fully understand what a virtual office program can do for them. Opus explains that for only $99 a month its virtual office system provides a business with a corporate mailing address, dedicated local phone and fax, mailing services, premium call forwarding, and voicemail to email conversion. Live trained receptionists take calls and messages during business hours. What does this mean for a businessperson? No costly physical offices and a lot more. A home based solopreneur can have an impressive corporate address instead of a PO box or disclosing a home address. He or she can get out and make sales or ply a trade with the confidence that opportunities won't be missed, as calls are forwarded to smartphone or professionally answered. Larger businesses find it easily affordable to extend image and reach by adding satellite virtual offices, all without leaving the head office. Opus VO's over 400 locations nationwide can help a company shine. Such as the newest in Boston. Steeped in history, Boston is an international center for higher education, medicine, research, culture and finance. The Greater Boston area has the 6th largest economy in the US and the 12th largest in the world. Major corporations are headquartered here, and it claims the nation's 3rd largest high-tech sector. Opus VO's prestigious corporate location boasts one of the most expensive zip codes in the nation. Not bad for a business to showcase on its business card, accept calls and email and ship from, all for $99 a month.